I do appreciate the comment! .and I like the pot!!!! I am honored you used my photo for this darling cookbook, Nancy. Who is Venessa Nitita? LOL! Yes we could have another book. Baked Beans are a warm weather favorite, and also great during the cold months as well. Wow you were so busy adding every one else's recipes that you forgot to add your own. So you can create another one and call it SUMMER TIME FAVORITES, and include recipes that we typically make during the summer, Potato Salads, Grilled Items, VEGGIE & PASTA SALADS Chops, Corn, Ribs, Burgers, I know you will think of them all. Smile It would be great to have all the summer time favorites in one book. Smile. Thanks Ma, & Have a nice day. Would you believe I forgot to add mine to this cookbook ???? "SUPER EASY SOUP" from a can of baked beans! 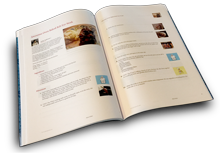 Be sure to see the 5 BBQ cookbooks ..posted this morning..
Great Book Ma, Thanks also for including our FAVORITE RECIPE IN THE BOOK. There are some really great recipes. Who knew there were so many great recipes.